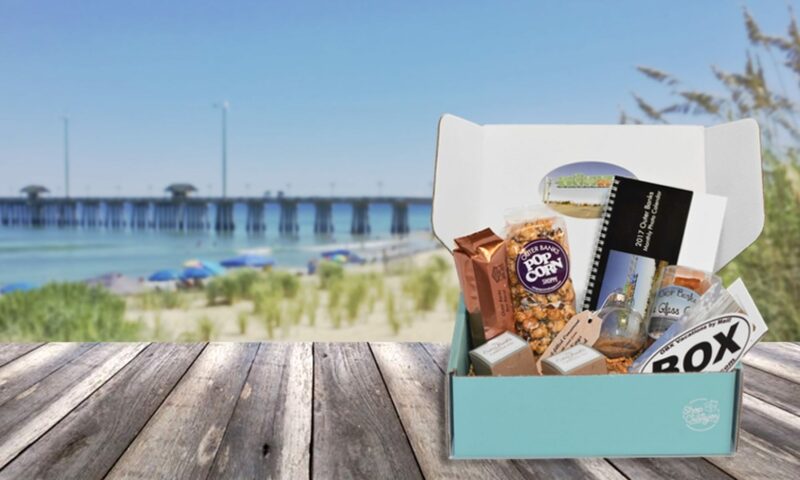 Get The Outer Banks Box! 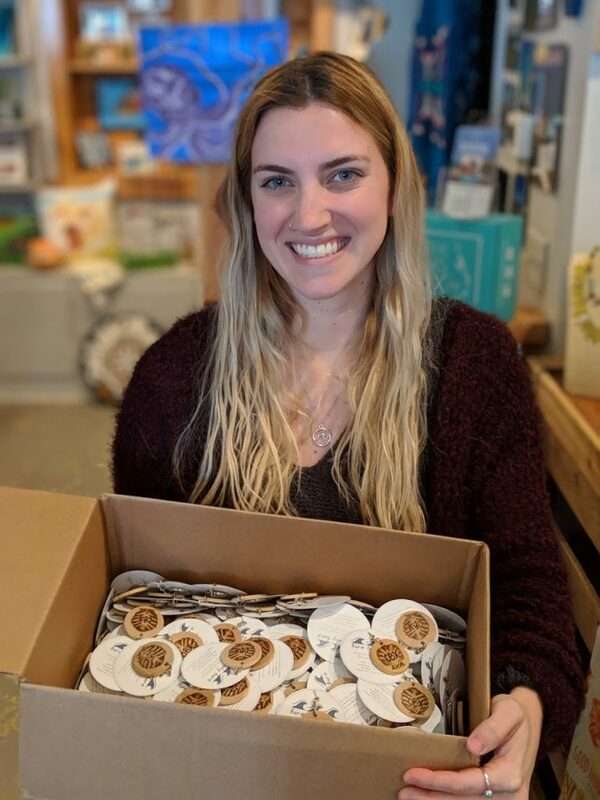 Meet Emily Caffrey of Burn Baby Burn, one of our favorite Outer Banks businesses! We’ve asked her a few questions about her business, her start and her passions and her life in the OBX. What started your passion for wood burning? Like many artists along the Outer Banks, the ocean has fueled my passion. I could say even further that scuba diving is the biggest inspiration that I have. Getting up close and personal with so many different fish inspires me to create a piece of artwork including them. Conservation is also a major drive for me–I like to learn fun facts about the animals that I create to share what’s so cool about them and why they are important to their ecosystem! How long have you been creating? How did you get into it? Do you work in any other mediums? I have been creating wood burnings since college. I was shown a burning tool by a friend and thought it was so neat. I tried my luck with it and loved it. Then I started to make burnings of things that inspired me, like wildlife. My first burning was a simple map of the U.S. Virgin Islands and then a heron! I liked to create animals much more than objects–straight lines have never been my thing! Although wood burning is my niche, I also paint, sketch, and enjoy photography. I like anything artsy. I have seen other pyrographers burn on water color paper; I’d love to try that next! Did you grow up on the OBX? What is your history with the Outer Banks? I grew up in western Maryland, but vacationed every summer to the Outer Banks with my family. During college I worked in OBX as a kayak guide with Kitty Hawk Kayak & Surf School which immersed me in beautiful areas of the Outer Banks that many have not visited. My love for OBX just kept growing, so I looked for work here after schooling and I landed a job at the North Carolina Aquarium on Roanoke Island. I’ve been here full-time for about 2.5 years. What’s your favorite thing about the OBX? Besides the beach? Saltwater marshes. I could spend endless time exploring the marshes, there are so many and each one is different. They are beautiful at any time of the day. During light you can see lots of birds, fish, and plant life while at night you can see bio-luminescence. Tell us about your background/day job? I am a SCUBA Instructor! I earned my degree in Environmental Studies from Salisbury University and after college I went through Divemaster and Instructor training and always hoped to combine the two together. And I have; I work as a Dive Safety Technician at the North Carolina Aquarium on Roanoke Island. I am a part of all the dive operations that happen in the facility in some form or another. It is my job to clean habitats, maintain and service SCUBA equipment, make sure other divers are safe, lead guest divers, train divers, and participate in an offshore Lionfish mitigation project (which is my favorite part about the job)! I have learned so much about wildlife and diving while working there that it has further fueled my passion for wildlife conservation. Which of your items is your favorite and why? I like the Caribbean Octopus that I did. Octopuses are one of my favorite animals; they are so interesting to learn about and to see in person (especially on night dives)! The piece itself also includes blue and purple colors, which is a fun addition to the burnt wood. The octopus totally needed the extra wow factor being that they are so vibrantly colored! Where in the OBX is your favorite place to go? Pea Island! Because it doesn’t get a lot of foot traffic, it’s such a fun place to walk the beach, look for shells, watch the sunset in a kayak on the sound, and enjoy some solitude when I need it. It is such a great place to get a look at the Milky Way at night! Are you passionate about anything else that you’d like to help spread the message about (Beach clean up, turtles, horses, kids, helping the hungry)? Beach clean ups for sure, or any clean ups really. I believe that you should leave a place a little bit cleaner than how you found it–and that’s easy to do by picking up a few pieces of trash along the way. It not only helps the place look cleaner, but it prevents any garbage from getting into water systems and in the bellies of curious animals. It’s easy to make small adjustments in your lifestyle to help make the world a healthier place (a.k.a. use reusable water bottles, straws, and grocery bags). Being more conscious about how your actions affect the place surrounding you. Have you been not so patiently waiting for Spring to get here? 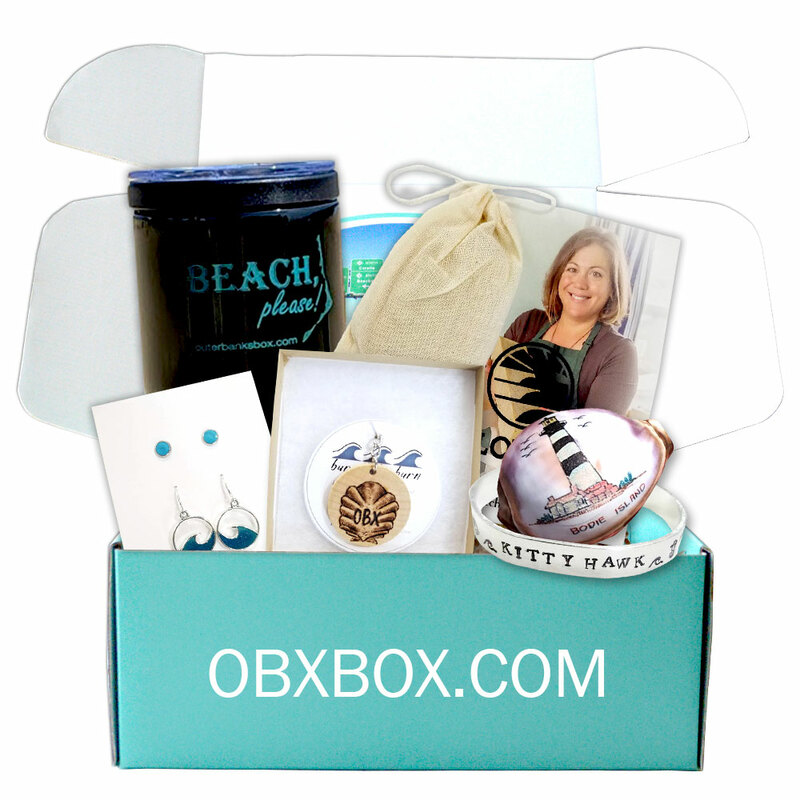 We have been so excited to get our Spring OBX goodies to your front door for some time now! This Spring Box has so many amazing Outer Banks inspired creations from small businesses and OBX lovers that has a total value of $85! When our subscribers opened their Spring box they most likely smelled Spring and Summer! The soap was created exclusively for our subscribers. Named “Equinox”, the scent has notes of Tangerine, Orange and Spearmint evoking a unique mix of hot and cool ocean breezes. With a hint of naturally antibacterial Tea Tree, this soap is perfect for travel, hopefully to the OBX! 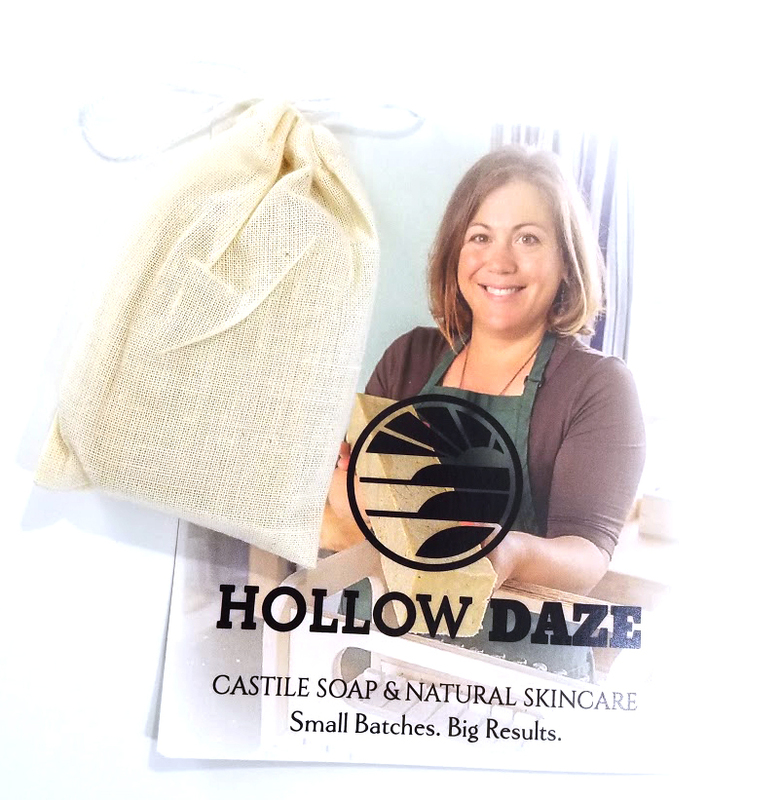 Hollow Daze can be found in Manteo, Avon and Dowdy during the market and craft show season! Like them on Facebook to see their show calendar and visit them during your visit to the Outer Banks! Equinox Ingredients: Olive Oil, Water, Sodium Hydroxide, Essential Oils of Orange, Tangerine, Spearmint & Tea Tree. Each of our subscribers received this one of a kind, specially made for the Spring Outer Banks Box! This tumbler is like no other. You can use this tumbler 3 different ways! 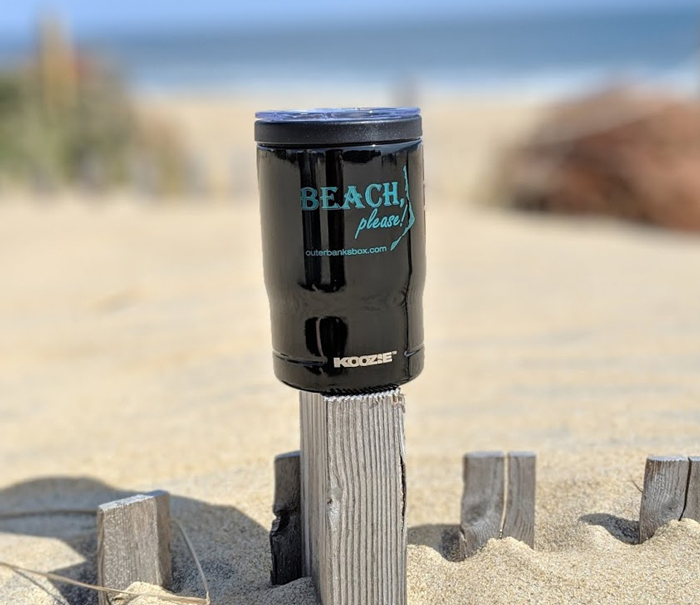 You can use it as a can koozie, bottle koozie or pour your favorite beverage in and pop on the lid and it stays safe from sand or salt water! The Outer Banks with tiny little scales were each lovingly hand drawn by Melissa of Crafty Mink. Crafty Mink is a North Carolina native currently residing in Virginia Beach. She’s lived on the coast for her entire life and has found inner peace, love and passion through her art. She creates coastal and beach decor via watercolor, acrylics and pen and ink. See all of her work on her Instagram account (link above) and show some love and follow. Visit http://craftymink.com/ for more creations from Crafty Mink! For our subscribers that chose specific towns we had a special treat! Hand stamped bracelets designed and crafted by Ann Marie Brown. 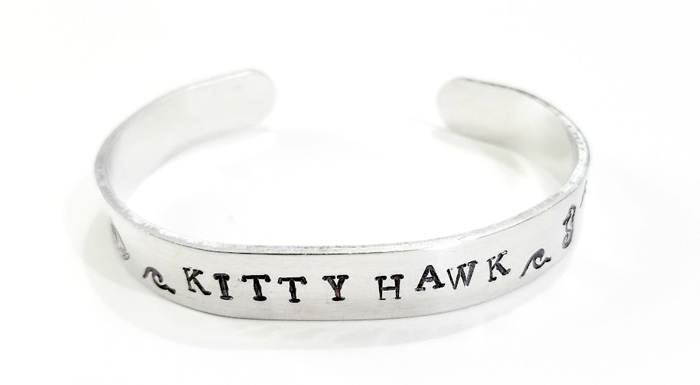 These bracelets are lovingly stamped with designs that represent that area. Anne Marie uses her days in the Outer Banks to capture the scenes she sees that touch her heart and finds their way onto jewelry or canvas and hopefully to your heart as well! She accepts custom orders and commissions! Burn Baby Burn created a specific design for our subscribers. Each hand burned, each a one of a kind, a mini master piece if you will! Emily Caffrey of Burn Baby Burn is an artist, environmentalist, pro scuba diver and OBX local! All of her larger pieces can be found on her website, you definitely need to check out more of her amazing work! 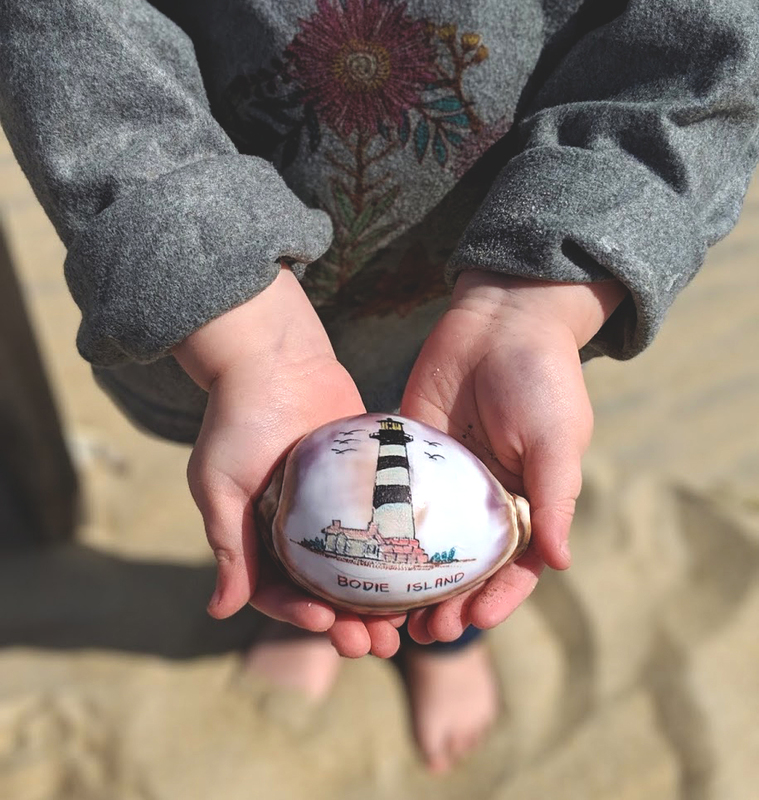 Lighthouses from all over the Outer Banks painted on little seashells were included in every subscriber’s Spring Box! Those that subscribed with a specific town favorite, received a light house either in that town or close to that town! OBX Local Jen Johnson of Blue Pelican Gallery in Hatteras gave every subscriber not only 1 set but 2! One set is a beautiful wave and the other a matching pretty stud set! 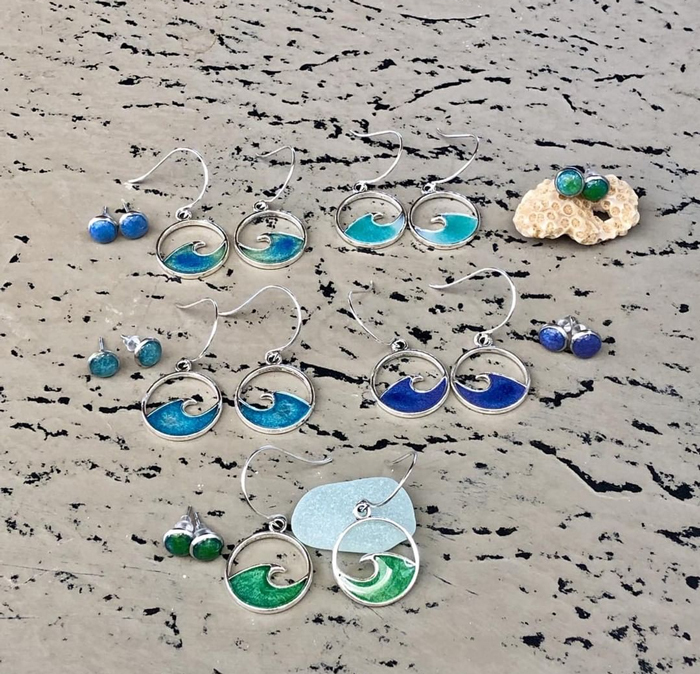 She loved making these earrings so much that she is giving away 2 extra sets of Waves and Mini’s. She’d love to see how they look on you! 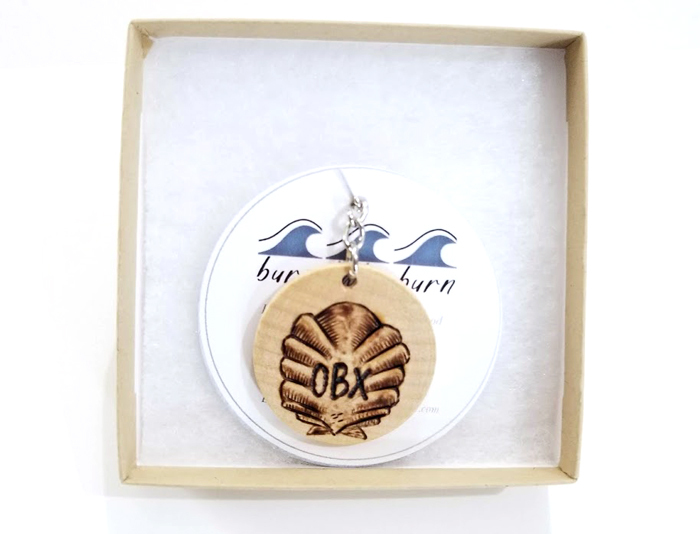 Post a pic on Facebook or Instagram before April 15th and use the hashtag #myobxwaves or #myobxminis or email photos to blue_pelican@mac.com and she’ll draw a winner on April 15! Until you can get back to the Outer Banks, you can visit Jenn’s website at https://bluepelicangallery.com/ taking a look at local art, jewelry, handmade soaps, candles, wall art, pottery, home décor, wooden furniture, yarn, fiber art supplies. And much more! There is time for our upcoming Summer Box but hurry, as we will be sending Summer Boxes in the last weeks of June! Click the big fancy “Order Now” button below to head over to our ordering section or read more about the Outer Banks Box!